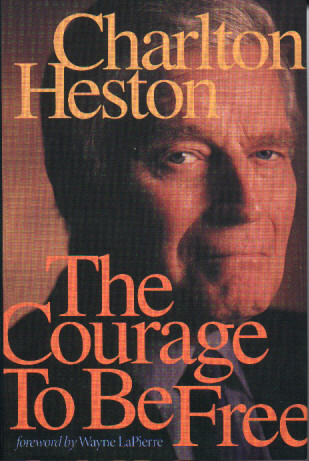 Amazon page for "Courage to be Free"
***PEN & INK: Charlton Heston's LAST (seventh) BOOK IS STILL AVAILABLE! Titled "THE COURAGE TO BE FREE," this 286-page hardback was published in 2000; Chuck talks about his life in the public (political) arena and offers his Ten Covenants of Courage. Reprints of selected HESTON SPEECHES are also included. To Order the book, go to the Amazon link above. According to Heston publicist Lisa DeMatteo, Chuck "decided to [self-publish]when he read about Stephen King's success with promoting/selling his own book."